If you use an iPhone or iPad, you know that there was a major upgrade recently to iOS; version 7. The most common complaint we’ve heard about this update is that it requires a passcode to unlock the device. And, by default, it requires that passcode EVERY time the screen goes dark. It is very annoying when you’re using your phone (or tablet), get distracted for a just a minute, and when you look back you need to swipe to unlock AND enter a passcode. Although this feature got turned on with the iOS 7 upgrade, you do have the ability to turn it off, or adjust it. Android phones and tablets have similar settings. Both are detailed below. There’s a setting for that! You can turn off the need for a passcode altogether, but we don’t recommend that. These devices contain a lot of your personal information. If you leave it on an airplane, or drop it at the park, you don’t want just anyone to be able to pick it up and use it. BUT, you can at least turn it down so it only asks for the passcode after some time has passed. You should see a choice now of 2, 5, 10, or 15 minutes; Or Never. The shorter the time, the greater the battery savings. However, having your screen go black every 2 minutes can be a bit annoying. We recommend 5 minutes. Choose to have it sleep after 15, 30 seconds or 1, 2, 5, or 10 minutes. If you chose something other than None, you can select a time for it to automatically lock: 5, 15, 30 seconds or 1, 2, 5, 10, 15, 20, or 30 minutes. You can also choose for the power button to automatically lock – thereby requiring some kind of code to unlock it. Published by MrsGeek, in Blog. 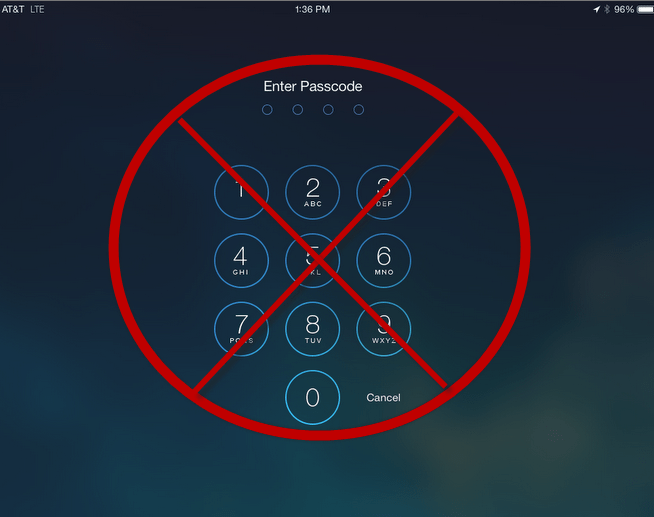 Tagged with iOS7, Smartphones, stop passcodes, Tablets. My I-phone does not ring or make a sound when receiving a text. This only happens with certain people trying to reach me. They end up leaving me a message and I have to call them back. Any ideas? The texts come through, but with no sound. Thanks!